Birds flock together for a reason: They need backup. Well, when power loss occurs, your home does, too. That’s why you need a whole-house generator from Swanton Energy Services. This device gives you and your home the power to venture through any storm with ease. With a backup generator as co-pilot, you can prevent your comfort and serenity from going off course. Here’s why: If your power takes a nosedive, your backup generator will swoop in and immediately deliver electricity to your home until you’re back on the grid. Unfortunately, most homeowners don’t think about buying a generator until a major storm, hurricane or power outage causes their home to lose electricity. At this point, it’s too late. Now, your only option is to wing it. But, if you find yourself here, you better buckle up. Without a backup power source, trekking through the storm is a bumpy ride. Power loss is a flight risk. However, it’s one you can avoid by installing a standby whole-house generator before you find yourself caught in the eye of the storm. A standby generator from Swanton is permanently installed outside of your home and will constantly monitor your electrical system. If it detects power loss, it automatically turns on within seconds to safely deliver power directly to your home. The best part about a standby generator is that you don’t have to worry about being there to start and stop your generator. That’s because this device pilots its own operation. Now that’s backup for your peace of mind. Make sure your generator is ready to run when you need it. Your generator is an engine and just like a car, it needs regular maintenance to perform reliably. Protect your investment that is standing by waiting to protect you, your family and your home in the event of a power loss. Without proper maintenance, a manufacturer may void your warranty. Our generator maintenance plan includes one visit per year. In the event of an extended power loss and continued generator runtime, a tuneup visit may be required sooner than one year. As they say, the early bird catches the worm. For you, the worm is peace of mind and, to get it, you need to install a backup generator. With this device, power loss is no sweat. To ride out the eye of the storm, fill out our online form or call us at 732-335-6731 today! 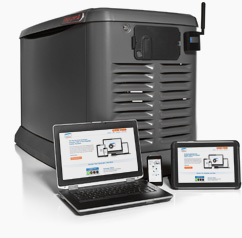 You can count on your MobileLink Automatic Backup Generator to deliver power to your home the second you need it. On top of that, this device has remote monitoring capabilities. Essentially, as long as you have access to a computer, smart phone or other mobile device, you can obtain critical information about your system and remain informed on its status from anywhere at any time. 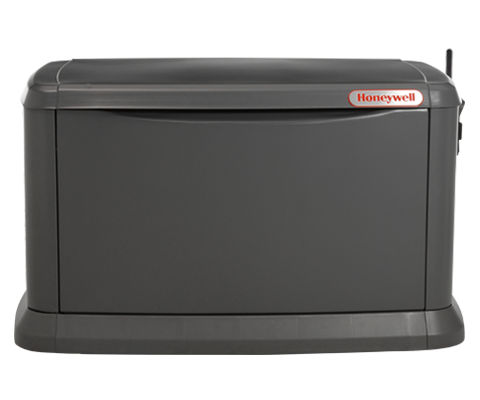 With Honeywell’s backup generator, you gain power and authority. *The Mobile Link app is currently available for both iOS and Android devices. It’s free to download via the iTunes App Store, Google Play and the Amazon Appstore.